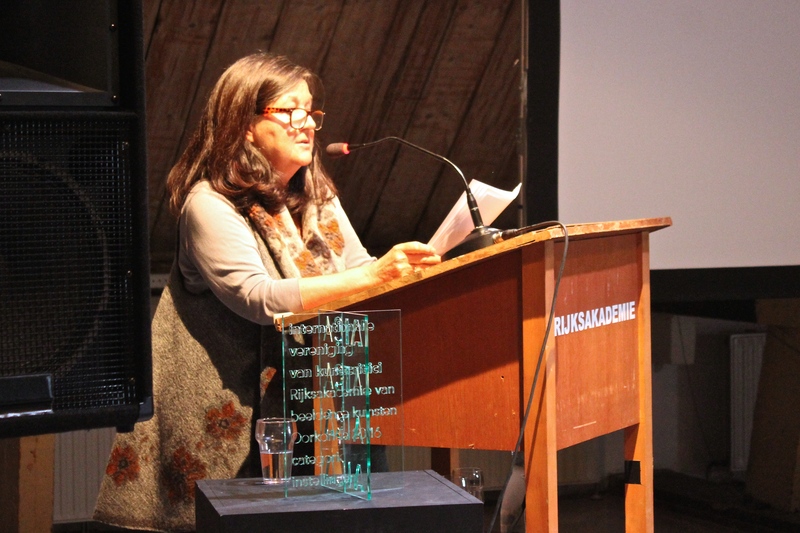 How extraordinary for AICA Nederland not to choose a curator, critic or museum, but a post-graduate institute for visual arts and – besides nominating Witte de With and an activity such as Art Rotterdam – to grant the AICA Award 2016 to the Rijksakademie van Beeldende Kunsten. I hereby congratulate you wholeheartedly. By ‘offering guidance’ I mean stimulating artists to become and remain those independent artists/sensors thanks to whom critics, philosophers, thinkers and everybody with an interest in art, receive signals about what is important to art and sometimes also about where the world is headed. With that, art education is obliged to transform and to constantly review the transmission from the perspective of contemporary developments. Translating to new generations demands commitment to the present. Is there a will to change, or a conscious desire to be rigid and resist external influences? Do people search for an authority outside their own circle? Or does affinity with current developments automatically result in osmosis, an open mind – also towards other institutions they cooperate with -, out of solidarity but also out of conviction? In his excellent anthology Art School, published by MIT, Steven Henry Madoff claims that the topography of making has been flattened, has become more horizontal in the past 25 years. No one discipline, genre, style or artist dominates, and this has forced art academies to focus even more on what it means to be an artist nowadays and where the profession is situated among other disciplines such as philosophy, research, crafts, technical training and marketing. I would like to add: while art is becoming increasingly more action, activity and research, we should not just focus on materialisation, reification and collectibility, because in the end what matters is what art conveys, and this can just as much be protest, resistance and alternative, presented in forms nobody understands yet, like ‘stealth messages’ to a small group of like-minded people who want to thoroughly question and test everything we regard as art and culture today. Compared to the position of artists, the role of art critics and curators is a more reflective one. But it is this extensive experience of colleagues what young artists need most. Passing on that experience in a peer-to-peer situation is exactly what they do so well at the Rijksakademie. The Rijksakademie exposes participants to many external influences and pairs them with foreign artists, critics and curators. More often than not the latter choose to invite them to participate in particular projects, a practice which has turned out to be very fertile considering the vast number of alumni one comes across outside the Netherlands as well. For curators are close to artists, and since a number of years universities and educational institutions have started to pay more heed to curators. The term ‘Educational Turn in Curating’ has been used to explain why many curators – myself included – started working in the art departments of universities. In hindsight I believe this happened because the art world became highly focused on the market and seemed to care more about taste than about philosophy, art critique or experience. As a result some universities became a ‘niche’ where a curator could lie low, where commerce does not influence things. That the latter statement is an illusion I soon found out, particularly in the U.S, where Chairs are sponsored and students have to borrow a lot of money to pay for their education. The educational turn, for that matter, seems to be over already. Why? Was it just a fad? No, and this is where the collectors come in: they have hired curators, given them jobs (after all many of them have started private museums. (Three cheers for tax deduction and higher social status!). The educational turn in curating moved from academia to being socially acceptable,and, as private collections are a lot less bureaucratic, can respond much quicker and don’t need a myriad of development staff; in the end they are their own sponsors! It has been an irrefutable fact for centuries that collectors are of great importance for artists. And it’s fantastic to see that a private collection was recently made available to the public at the highest level in the Netherlands as well and that, thanks to the fact that the Dutch government has finally realised how essential financial grants are, the artistic landscape has expanded with more modest collections as well. The Rijksakademie knows how to engage such actors too; they avidly visit annual open days, and collectors are also represented in both their board of governors and supervisory board. All because they want to be close to where art originates. But what does art ‘education’ or this ‘mentorship’ consist of at the highest level? Of offering its participants the best possible facilities and creating contacts which are of great importance for a truly international professional practice. Viewed from the U.S., art education in the Netherlands is very agile, inventive and broad, although proper reflection and theoretical foundation are addressed a little later – and sometimes too late, as far as I’m concerned. It’s not easy to choose ‘the best’ from such a broad spectrum of post-graduate institutes, which have all had to cope with severe cutbacks. Apart from that, the idea of a prize is quite specific, where you often have to compare apples and oranges. Seen from a distance AICA Nederland could have considered post-graduate education as a whole, where the Rijksakademie, the Ateliers, the Jan van Eyck and many other active and successful institutes, no matter how different from each other, jointly offer a powerful basis where developing artists are given the freedom to develop. The reason the Rijksakademie is first among its equals can be attributed, in my opinion, to the fact that already early on it has chosen to operate on a wide geographical scale by which it has shown a broad diversity. Moreover, the Faculty at Rijksacademie are very talented artists, many from abroad, who work and have worked there on and off for years. My former colleague from New York, Dennis Adams, taught at the Rijksakademie for eleven years. He describes its selection process as very rigorous and its teaching as ‘the very best of the best’. Still, he also found the Rijksakademie had a monastery quality. Is this perhaps caused by the fact that it doesn’t venture into the outside world all that often, apart from during the “open days”? Ladies and gentlemen, at the end of this laudatory speech I want to ask for a big round of applause for the long-standing success of this beautiful institute. Long live the Rijksakademie!